Everyone in the restaurant business knows it can take years to turn a profit, but Iron & Ale, which opened in late January, is already exceeding all expectations. Located in Cornerstone, McFadden attributes their success to a supportive residential community, repeat customers, and a great staff. “We wanted to create a restaurant where people knew we were excited to have them there,” she said. Their formula is working. The restaurant’s general managers keep things running smoothly while the chef creates food that keeps customers coming back, she said. 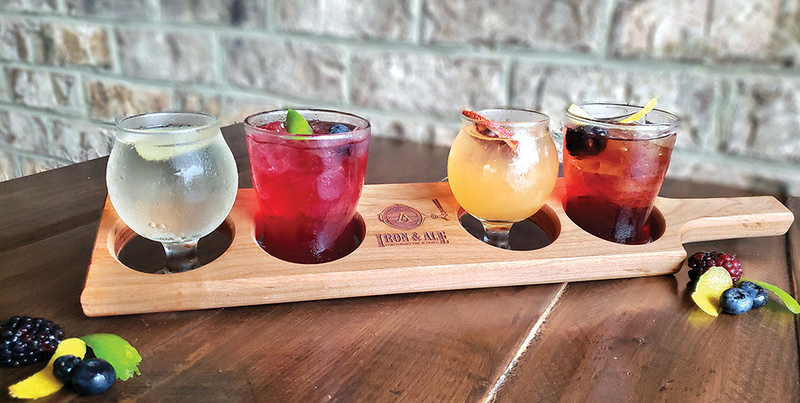 “My first meal at Iron & Ale was lunch with friends, which I enjoyed so much that my family and I went back for dinner that evening to celebrate my birthday,” said Carolyn Eubank. “I especially appreciate the fact that the food is so fresh and the menu so varied that everyone can find something they like on it. McFadden says they source much of their produce and meat locally, including grass-fed, hormone free beef from 7 Hills Food in Lynchburg. A view of Cornerstone from the second-story balcony is the perfect way to enjoy a lunchtime meal. Or, when the workday ends, customers can enjoy chef-crafted dinners paired with a glass of wine on the veranda or under an elegant chandelier. The restaurant also features 15 TVs, including a 150-inch projection screen for sports enthusiasts. The upstairs taproom offers more than 30 taps of the best local and national craft beers. Guests can also try signature Manhattans or martinis in the downstairs lounge. Happy hour is a new addition to the offerings at the restaurant, which is open seven days a week and located at 106 Cornerstone Street.